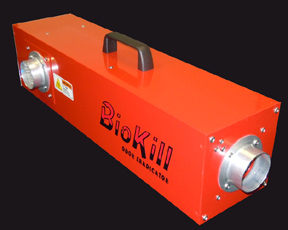 BioKill professional products remove malodors, surface mold, pathogens and pests and must be operated while the treatment premises are temporarily unoccupied for several hours. They are critical equipment used widely by professional businesses performing disaster recovery services. 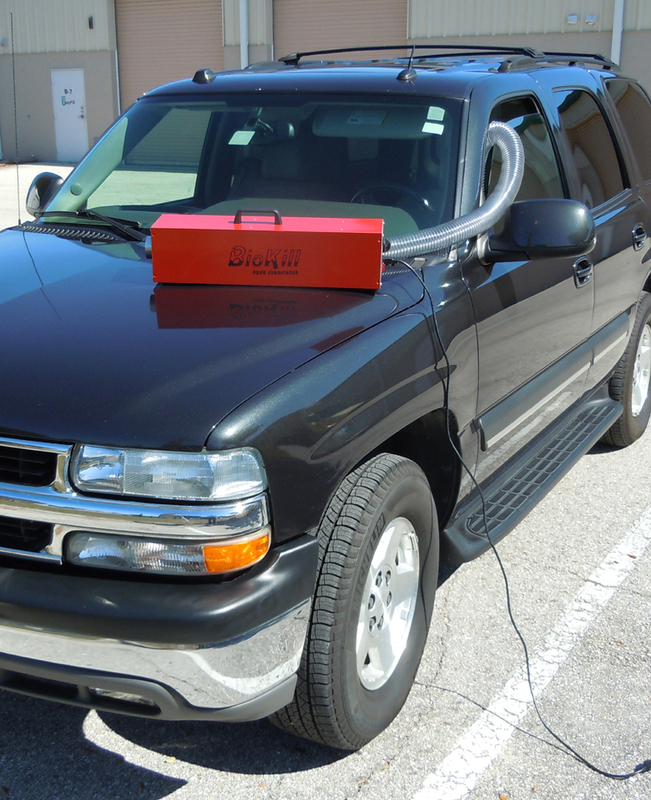 Stinky, unsalable cars are converted into sales with this portable, powerful model It is designed as a powerful odor eradicator for vehicles - automobiles, trucks, RV's, boats, and train cars. 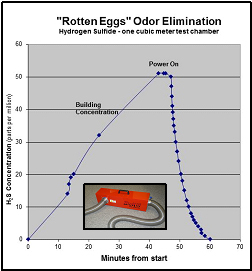 It eliminates embedded odors and mold spores and can even be used to clean up shipping containers for reuse. The unit works by molecular disintegration of suspended organics flowing through it. 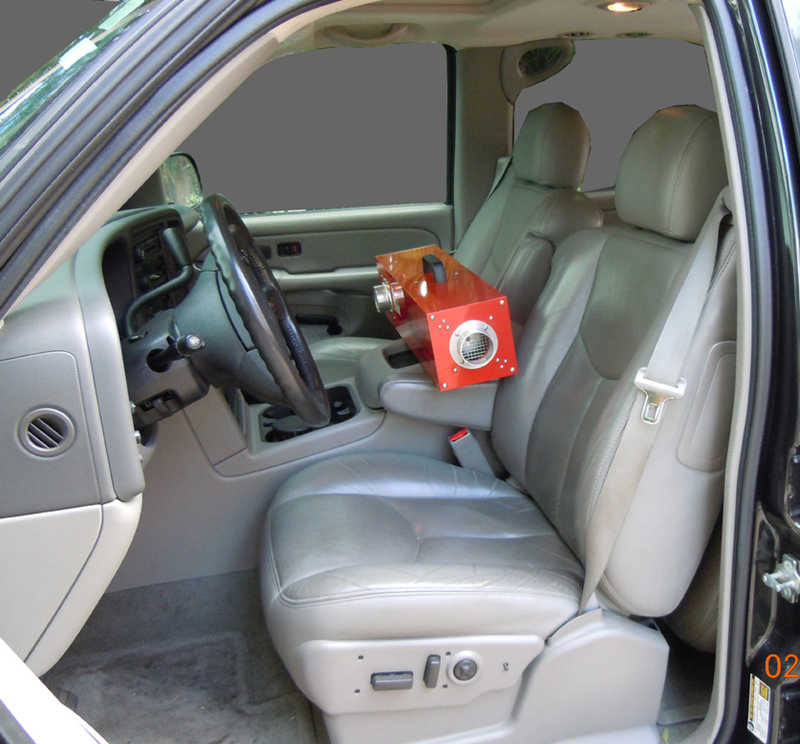 It also exports an extremely high ozone gas concentration that reaches down into the air conditioning system of the vehicle, particularly the coated condenser surfaces, to dislodge and suspend those odor particles so they will flow through the BioKill unit for complete eradication. This model has a built-in job timer that is selectable up to 120 minutes, but 15 or 30 minutes per job will usually suffice. It has aluminum hose ports which accept slide-on 2.5 inch diameter flexible hoses to simplify vehicle setup and cleaning. A 10 feet flexible hose is included with the unit. To further simplify your job a portable dc-ac inverter that connects to the car's battery terminals is also included with the unit, allowing you to perform each odor eradication job without having to run an electrical cable to the parking lot if you choose. Combined with its ease of portability and ruggedness, this equipment produces immediate results, and produces them with a minimum of service labor attention.